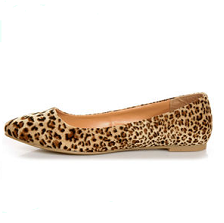 Saddle up to the “Sadler” in Cheetah animal print and you’re set for any outfit your closet can throw at you! The City Classified Sadler Tan Cheetah Pointed Flats are smooth as velvet in vegan kid suede, with a sleek pointed toe that’s always in vogue. Prints may vary slightly. 1/4″ rubber heel. Lightly cushioned insole. Non-skid rubber sole. Available in whole and half sizes. Fit is true to size (round up if you’re between sizes). Measurements are for a size 6. All vegan friendly, man made materials. Imported.